Growing food on Mars?! : 21.10. Work hard, play hard? 21.10. Work hard, play hard? We and the other Epic Challenge team, "The Red Sandbox" went and watched the movie The Martian yesterday! 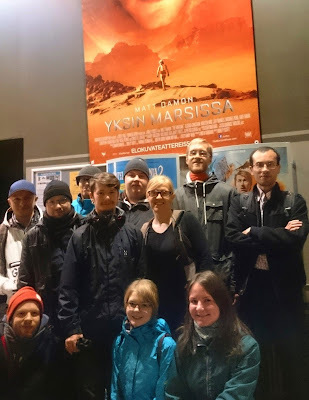 Afterwards we talked a little about the differences of the movie and NASAs real Mars plans. We sure hope they're not sending Matt Damon there, he seems to get into a lot of trouble in space. But we enjoyed the movie and suggest You go see it as well! PS. About our current workflow, we are individually studying different Mars-themes, which we will then (at the end of the month) teach to each other! 15.10. Our Facebook-page and official logo!